Wow, that's not cool. And he had a valid pass. Based on the globe article they could have made out the "OCT 2017" had they spent more time looking at the ticket and very well could have allowed him to board but urge him to get it replaced at the counter the next day verses just telling him he had to go to the ticket counter and could not board until it was replaced. Unless there is a new published statement of fare (most I could find recent at https://d3044s2alrsxog.cloudfront.net/u ... 0Final.pdf) then these platform ticket checks violate the T's fare rules. * On inbound trains on weekdays (non-holidays), when departing from a station where tickets are sold onsite. A list of locations of where tickets are sold is located on www.mbta.com. If a passenger tries to board the train with cash in hand, and a ticket checker and the Transit Police detain him, they are violating the T's own published tariff rules. As far as I know that has not changed. But there is a new Automated Announcement that starts at 4pm at least at North Station that says passengers required to have their passes/tickets out and visible for ticket agents to inspect prior to boarding. It also mentions something about activating mobile tickets. I don't remember the exact language. Yesterday they drove me nuts by making me walk through the whole queue line to board the 4:30 Newburyport Express train when there was no line / no crowds. I tried cutting through directly to track one through it and they wouldn't have it. And after all that, they didn't even check my Monthly pass. People going to Salem obviously got passed them, because one was paying cash onboard for the $10 round trip Salem ticket and was arguing about being charged $13 on board. I have heard those announcements, and have seen the signs saying the same. On-board sales are still an option, but trains being checked require passengers to have tix prior to boarding as part of Fare is Fair. In other words, "you can still buy tickets on board unless we tell you at the platform that you can't, and we won't tell you in advance which trains will be checked in advance." Of course these legal technicalities are moot unless someone challenges them. And with this arrest, maybe, just maybe, this whole charade will be struck down as against T policy. I have little hope though. saulblum wrote: Of course these legal technicalities are moot unless someone challenges them. And with this arrest, maybe, just maybe, this whole charade will be struck down as against T policy. I have little hope though. And lets hope this gets challenged. Sounds like they picked a fight with a guy who may very well do just that. A paralegal who works at a law firm and who refused to have the charge of trespassing dismissed by writing a letter of apology as he feels like he did nothing wrong. He did do something wrong, he deliberately escalated a situation that could have been avoided rather easily. He wasn't arrested for having a faded pass, he was arrested and charged with civil disobedience. He knows what he's doing and will accept what consequences come of his actions, and for that I say all the power to him. But taking your frustration towards a policy out on those who were charged with enforcing it is foolish and it accomplishes absolutely nothing. There is no such crime as civil disobedience. Civil violations usually do not result in an arrest. The thugs are the enforcers and those who employ them. Why would someone apologize for being right? Just getting caught up on some posts and saw about how there were claims this was working because mTicket sales are up. Uh, actually, no, that means nothing. How many fewer people are no longer paying cash on-board? So now they are forced to use other methods, especially mTicket, and they're no longer collecting the cash-fare surcharge of $3 per fare. It is possible they could be losing money, even without factoring in all these staffing costs for ticket checkers. Once you factor in the staffing, there's no way this makes sense. Meanwhile, there's a shortage of crews whether you have ticket checkers or not. Pathetic. The fellow that was arrested ought to proceed to a trial; refuse to accept a dismissal. Demand a jury trial. Trials cost a fortune. This guy may have a viable lawsuit against the MBTA and Keolis, as the tariff states that passengers may purchase tickets with cash on board, with the caveat that it is 3 dollars more when departing from a station that sells tickets. The ticket checkers should study the tariff more closely. I'm not surprised this happened though, they're not exactly the brightest of the bunch. On the South Side some of those ticket idiots tried to prevent an engineer from boarding his own equipment! edbear wrote: There is no such crime as civil disobedience. Civil violations usually do not result in an arrest. The thugs are the enforcers and those who employ them. Why would someone apologize for being right? 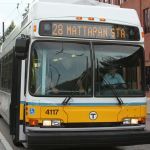 The Boston Globe's Article wrote: “Civil disobedience, arrest me,” Yarin said, according to a Transit Police affidavit. He doesn’t dispute the quote. I was quoting the article, actually I was quoting the paralegal. He was arrested for trespassing. He admits to deliberately escalating the situation to the point which Transit Police directed him to leave and he did not. That's the crime he committed, the pass and fare procedures are irrelevant at that point. I feel like the Transit Police should have at least taken a moment to verify that the ticket is valid and if the passenger is frustrated allow them to board and remind them to get it replaced the next time they are at north station. I feel like they along with the ticket checkers also escalated the situation be refusing to look at the ticket closer / validating it and simply telling this guy you can't board. Go to the ticket counter and get a new ticket. So what would it take for the T to have tickets produced that don't fade? I've never used a monthly anywhere. Are they paper, plastic? they can be either. If you order online in advance, plastic. If you order from the machine or buy from the ticket office you get the same paper ticket with the orange triangle you do for a single subway fare. And those things more often than not at the end of the month are faded. Faded passes cannot be reissued once the next month sales have started.